Bach wrote a huge number of chorale settings, some of which can be found in his great Passions, oratorios, motets and, of course, throughout his cantatas. These Protestant hymns provided invaluable teaching material, in addition to focal points for his church writings. His genius for creating arrangements of complexity and beauty from often meagre offerings is breathtaking and is compellingly presented across these nine CDs. However, these discs are not an unqualified success and some listeners may take issue with Rillingh�s overall approach, both in terms of the ordering of chorales and the performance itself. The first obstacle in such a mammoth undertaking concerns organisation of the more than 180 chorales. As the original four volume Breitkopf Collection of Bach chorales (1784-1787), and the Bach-Werke-Verzeichnis (BWV) ordering system was of little help, Helmut Rilling decided to arrange the pieces thematically. 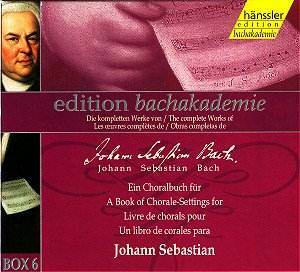 Taking clues from the hymn books of Bach�s time, most notably that of Schemelli (1736), to which Bach contributed, themes were found within which various chorales could be placed. For the most part, this approach works very well. For example, there is much uplifting and joyful music to be found in the first CD (78), which concerns the feast of Advent and Christmas. Far bleaker is the disc of Passion chorales (79). A very welcome addition to all discs is the inclusion of chorale arrangements for the organ. These help to maintain interest and also offer relief from what can sometimes be emotionally exhausting music, particularly in the case of CDs 79, 81 and 85. The performances themselves are of a consistently high level, technically at least. However, Rilling seems intent on maintaining a smooth delivery and a consistent tone that can become monotonous over time. I would urge you to dip into these recordings rather than try to sit through entire discs at a time. The singers are excellent, although the spacious acoustics of the Stadthalle, Sindelfingen, renders the voices rather indistinct. I was also put off by the level of vibrato employed in the upper registers. This seems rather out of place in recordings that otherwise appear more guided by historically informed performance practice than is often the case with Rilling. Of the various discs, the first (78) is perhaps the most immediately arresting, including some beautifully played organ chorales (including the famous Nun komm, der Heiden Heiland, BWV 599). There are also a number of superb sacred songs, my personal favourite of all being O Jesulein süss, o Jesulein mild (BWV 493), arranged for alto and bass. Listeners will also instantly recognise the chorale setting In dulci jubilo (BWV 368) tucked away on this disc. As a whole, the performances fail to bring the required weight to the more dramatic pieces, many of which are collected in the second set (Passion). This is a pity, as there are some absolute masterpieces here such as Herzliebster Jesu from the St John Passion (BWV 245). However, it was wonderful to hear all the chorales of the lost St Mark Passion (BWV 244) gathered together on this disc. The music, despite my reservations about the performance, cannot fail to impress. The centrepiece of the following set (Easter, Ascension, Pentecost, Trinity) is Christ lag in Todesbanden, presented as two strophes of Martin Luther�s hymn arranged for four voices (BWV 277, 278) followed by an organ setting (BWV 718). The chorale cantata constructed around this hymn (BWV 4) is one of Bach�s most popular works, and its presentation here is very effective, with the organ arrangement respectfully played by Gerhard Gnann. Similarly, Valet will ich dir geben (BWV 736/415) is tremendous and the short chorale setting deeply moving. The German Mass contains some of Bach�s most difficult and opaque music. Scholars have remarked that it signalled a turning point in his life towards his late period of even greater concentration on the science of fugue, canon and variation on themes. Disc 81, which contains settings of the Kyrie and Gloria from the Mass as well as various related chorale settings and organ preludes offers music of monumental stature, but is lacking warmth in this performance. Disc 82 includes a large number of short psalms, which although attractive, are delivered with the same style and tempo, rendering the overall effect rather dull. More successful are the settings for incidental festivities, which include the vital organ prelude and chorale Lobt Gott, ihr Christen allzugleich (BWV 732). Despite my complaint that these performances can lack conviction and intensity, at times they are quite wonderful. The set gathered together under the theme of Morning (disc 83, tracks 1-11) is particularly impressive (with the exception of the song Die guldne Sonne, sung with a vibrato that seems totally out of place). Once again, however, with 36 tracks on this CD, greater variation in nuance and tone would have been welcomed. Rilling conducts the themes of patience and serenity (disc 84) very well and his approach, which is the antithesis of, say, John Eliot Gardiner, seems best suited to the more contemplative pieces. Some of the finest music is left to the final double set (CD 85). Particularly fine are the chorale settings Von Gott will ich nicht lassen (BWV 418) on the first disc, and Alle Menschen müssen sterben (BWV 262) and Christ, der bist der heile Tag (BWV 273/1120). Once more, though, with 63 tracks spanning these two discs the kind of variation of colour and tone needed to maintain interest is in short supply. Rilling has clearly put a great deal of time and energy into organising these wonderful pieces and it is quite an achievement. I am sure I will return to the discs from time to time, yet, ultimately I was disappointed that there was not sufficient emotion expressed in the performances. In these chorales we can find joy, sadness, anger, pain, ecstasy and any other emotion you care to mention. The recordings provide beauty in abundance, but these versions do not tap those emotional highs and lows reflected in the texts and in Bach�s astonishing arrangements. Libretto and notes included in German, English, French and Spanish.